The best tastes of Italy are brought to the West End by Little Italy. 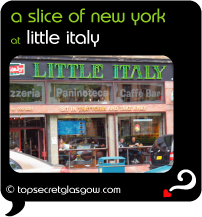 Delicious Italian food and possibly the best coffee in Glasgow are combined with friendly staff, early opening and late closing, to produce a true Glaswegian gem. Fresh pasta and dreamy sauces are perfect, and the pizza is made fresh from scratch every day. Sit in the window stools delight at the food, watch bustling Byres Road go about its business while listening to real Italian radio, all thanks to Little Italy. Little Italy does not offer any booking services that we know. You can always contact them to check. Great news! Finding this page means you can now join our VIP list for Little Italy. Time to grab your very own page all about Little Italy. Do you have a special story about Little Italy? A funny experience? A grand occasion? A funky photo? A personal tip? A top secret?